Make a statement with your front door and instantly increase the curb appeal of your home with an easy and low cost color makeover by painting or refinishing your front door. Think beyond traditional hunter green, colonial red, black or tan colors and open the door to a wonderful opportunity to personalize your home and express your unique style. If your home has neutral colored siding, experiment with front door paint colors such as robin’s egg blue, sassy lime green, raspberry glaze, bright yellow, bright orange, chocolate brown, burgundy, cool Caribbean blue, cobalt blue, minty green, honey yellow and coral pink. For homes that have colorful siding, choose subdued door colors that do not compete with the siding. Good options to consider are sea foam greens, pale yellows, deep pinky red tones and rich blue-greens. If your home has brick or stone elements, choose door colors that echo the subtle tones in the stone such as loden green, burnt orange, deep eggplant, royal purple or lilac. For those braver souls, varying shades of pink from blush to fuchsia can make a bold statement and a guarantee to be noticed. Orange is said to expand your thinking and reduce self-consciousness, encouraging self-expression. It is also a color of youth, playfulness, laughter, celebration and vibrant energy. Deep blue evokes a feeling of efficacy and purity of thought and mind. It encourages the reduction of clutter in our lives as well as the integration of the long view and the short view, allowing us to make important decisions with wisdom and grace. Light blue imparts a sense of peace and tranquility, bringing ease and harmony to your home by eliminating discord and calming aggressive tendencies. Aqua tones create trust and the space for us to truly relax and let go. Green is said to increase wealth and as the primary color in nature’s canvas, represents the richness of life. It is a good color to inspire new beginnings and personal growth, encouraging us to manifest our individual talents and skills in the world. Green is also a healing color, evoking feelings of stability, balance and renewal. Light purple creates a sacred space for spiritual connection and compassion, deepening our sense of humanity. It is a feminine color that evokes grace and elegance as well as creativity and success. Bright red is fortifying and stimulating, evoking courage and fearlessness. Red is known as a color of self-confidence and enthusiasm. Deep red inspires deep passion and reminds us to live fully and express our true natures by removing the emotional blocks that prevent the honest expression of our selves. Yellow helps to improve mental focus and clarity of thought while inspiring conversation and mental agility. The lighter colors help to dispel darkness and keep our eyes open to the brighter side. It is the color of optimism and enlightenment. Pink tones speak to the heart and ask it to be open and tender. Pink is gentle and soothing and can help with emotional transitions by promoting openness, understanding, acceptance and calm. 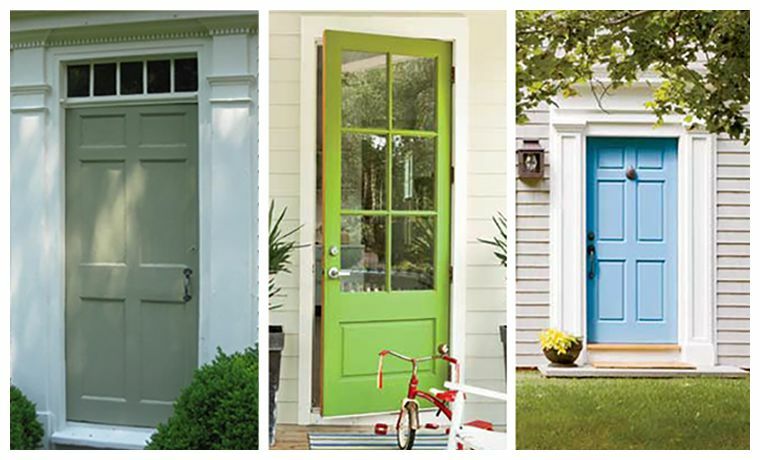 You can peruse our Pinterest Board on Front Door Colors for more inspiration on revitalizing the entrance to your home.